ver the past number of months, we have put considerable work into our submission on the Draft Regional Spatial and Economic Strategy (RSES), which if you are so inclined, is available to read on our website. On reflection, as much as I am proud of the body of work and the important points that are outlined in it, there is one thing I am delighted to take away from the whole experience and that is now, more so than ever before, key stakeholders are working together with a new cohesive vision for what we want our Waterford to be. With this in mind, it is fitting that the conversation about Waterford’s ambitious plans for sustainable growth has finally begun. If we are to achieve our full potential, we have to take ownership by working together to become masters of our own destiny and by looking beyond Government handouts. I had the pleasure in meeting Danny Cunningham recently, who works with Enterprise Ireland in Riyadh, when he was home in Waterford for a few days. Here’s a guy who has extensive contacts across the Middle East, who are only looking for opportunities to invest in Europe. 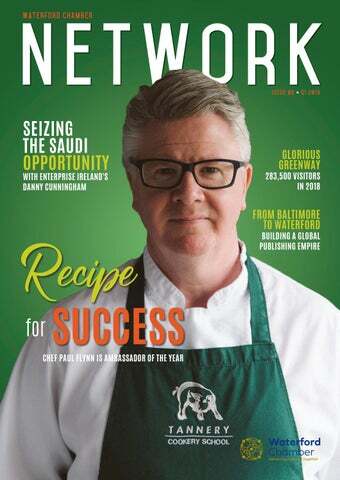 Waterford already has a number of connections with Saudi Arabia and Danny has offered to assist us in identifying specific investors for specific projects. Falcon Real Estate are here…so the question is, are there others? Tubbritt. Icons on pg. 4 made by Freepik from www.flaticon.com. Your One Stop Decor Shop Come and visit us in our stunning store and see our fantastic colour ranges and wall of wallpaper display. Hundreds of designs and styles to choose from. FREE interior design advice and colour consultations available in store - feel free to bring us in your photos or fabric samples to help choose the best colour for your design scheme, inside or out! Expert advice and help for the professional finish to all your decorating projects. Visit us today! international trade agenda, a competitive global approach to tax reform, and a fully connected digital Europe that support innovation. Waterford Chamber staff and representatives from member companies also recently met with the Irish Ambassador to the US and the Australian Ambassador to Ireland during their visits to Waterford to discuss international trade challenges and opportunities. 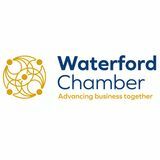 Waterford Chamber continues to voice the opinions and priorities of our members into regional and national plans. Most recently we responded to the Draft Regional Spatial and Economic Strategy as well as the Waterford Metropolitan Area Strategic Plan. Key issues addressed included issues relating to housing, intercity road infrastructure and air connectivity, higher education and enterprise supports. Be assured, we are keen to play our part in getting the message across that Waterford, as the Capital of the South East Region, is a great place to work, live, invest and do business. With your help, we will continue to lobby on behalf of Waterford to ensure it features highly on the priority agendas. Enjoy the read! As renowned chef Paul Flynn picked up the accolade of Ambassador of the Year at the Waterford Business Awards, Lynda Lawton spoke to him about his passion for his home county and his unwavering determination to offer the very best in dining experiences. hroughout my career I have had the pleasure of interviewing many of Ireland’s top chefs. A question I always finish the interview with is what is your favourite meal? Paul’s was emphatic – bacon and cabbage! You might expect one of Ireland’s best chefs to say oysters or chateaubriand, but by choosing the humble bacon and cabbage it shows the respect he has for simple ingredients and in some ways it says a lot about him as a man. His values are as traditional as his choice of favourite food – family is everything and with hard work and determination you can succeed. With that as his mantra, it is easy to see how Paul Flynn has become a TV personality, author of four books and one of Ireland’s most loved chefs. And yet, while a large part of his career is now in the spotlight, he openly admits he ‘winces’ every time someone calls him a celebrity and his emotion was evident as he revealed as the Ambassador of the Year at the Waterford Business Awards, saying “The award is totally unexpected and I am humbled by it.” It is a fitting tribute to a man whose culinary career began in a chip van at 15! “I had no clue what I wanted to do. At that stage I would do anything to avoid having to study. But when I was 17 I went to work in Merry’s in Dungarvan with a great chef called Paul McCluskey and from that moment I just knew I wanted to be a chef. Paul’s training, along with my own ambition, gave me the courage to set off for London at 18 and by 23 I was Head Chef in a 2-Star Michelin Restaurant.” But the call of home pulled Paul back to Dublin and from there home to his native Dungarvan. would have worked, but I didn’t spend all those years training to just end up cooking steak.” Paul and Máire’s hard work and steely determination has certainly paid off and now with 30 staff in the summer months, Paul says life is good “but we never take the foot off the pedal. It is never smooth sailing. You have to keep your eye firmly on the business”. “I’ve tried all sorts of hobbies but my mind always comes back to food so I’m going to stick with what I’m good at! I love nothing more than going along the Copper Coast collecting lobsters and fresh mackerel. It makes it all worthwhile. “The Greenway has been amazing and we really needed that boost. We just needed something to point people in our direction and it has changed everything. The evident entrepreneurial spirit has been fantastic for the area. Yes it brings more competition to everyone but I say the more the merrier. There’s no point always worrying about others, you need to concentrate on how you can be better. The recession battered us and there are always challenges but you have to be committed. We are heavily involved in the West Waterford Festival of Food and I always say if you can get people down here, they will come back. All we have to do is make sure people have an amazing time.” And with that, it is clear to see why chef Paul Flynn is the Waterford Ambassador of the Year. As Falcon Real Estate move closer to beginning the development of the North Quays, the burning question is are there more Saudi investors who would be willing to look at Waterford for investment opportunities? Saudi Irish Business Council Meeting in the Saudi Council of Chambers in Riyadh. GETTING THE MESSAGE RIGHT The time has come for us all to get on the same page in terms of promoting Waterford. Our scale and catchment area compares very favourably to the other cities. The Waterford City Region is a region of scale as the figures below confirm. What we need now is for all businesses and stakeholders to use the figures below when promoting their business or opportunities in Waterford. BUILDING A GLOBAL PUBLISHING EMPIRE Nestled in the beautiful rural setting of Woodlock House in Portlaw is a hive of activity you would never even guess was there. Lynda Lawton speaks to International Living Publisher Jackie Flynn about finding the perfect location for their growing Agora Companies hidden among ancient trees on a 40-acre site. Above: The Internation Living team at Woodlock House Below: Jackie Flynn speaking at the official launch of Agora Companies. Investment committed in the region by Bausch and Lomb, Glanbia and MSD. Furniture as unique as you... Our stunning collection of fine quality traditional and contemporary furniture, beds and accessories are beautifully displayed in our award winning showroom. aterford’s chest swelled with pride recently as Waterford Institute of Technology was declared the top Institute of Technology in Ireland. However, what is perhaps less well-known is that nestled at the fringes of the IDA Industrial Estate lies another entity that is leading the way in technology and innovation. SEAM is now considered the top performing Technology Gateway Centre in the country and the go-to centre for universities such as Trinity, DCU, UCD and NUI Galway. It also boasts over 185 industry clients, from Boston Scientific to Teva to Stryker. organisation, we are constantly investing in upgrading our equipment infrastructure so as to ensure we provide our clients with a world class analysis and problem-solving centre. We in SEAM foster a strong customer-centric culture with a mission to establish long-term business relationships with clients, becoming an extension of their organisation, understanding their business and delivering on their technology needs.” Undoubtedly, SEAM’s key strength lies in finding real solutions for real problems in a timely manner and at short notice. Simply put SEAM are fixers – the best fixers in the business and are a shining example of the level of excellence in technology and innovation that exists in the region. upgraded and all rooms will be of a 4-star deluxe standard with riverside deluxe rooms and suites. With a new head chef Nigel Cloney at the helm and a management team who are the best in the business, Waterford can look forward to welcoming large-scale conferences and events into the future, while also offering top quality accommodation for tourists and visitors alike. * One way incl. taxes & charges. Terms and Conditions apply. See norwegian.com or an authorised ITAA agent for details. Tracy Cullen, City Enterprise Centre presenting the award to Dee Jacques, Solas Cancer Support Centre with Kathryn Kiely, Waterford Chamber President and Teresanne O’Reilly, WLR. Amber Young, KBC Bank presenting the award to Padraig Dolan, HavenWood with Kathryn Kiely, Waterford Chamber President and Teresanne O’Reilly, WLR. Liam Moran, Faithlegg presenting the award to Chris Russell, Thimba Media with Kathryn Kiely, Waterford Chamber President and Teresanne O’Reilly, WLR. Martin Freyne, PwC presenting the award to Eunice Power, Eunice Power Cooking for You, with Kathryn Kiely, Waterford Chamber President and Teresanne O’Reilly, WLR. Marguerite Brahim, Cpl Resources presenting the award to Irene Lawlor, GSK with Kathryn Kiely, Waterford Chamber President and Teresanne O’Reilly, WLR. Jacqui Gaule, Waterford Local Enterprise Office presenting the award to Craig Dee and Stephen Lynch, Coach House Coffee, with Kathryn Kiely, Waterford Chamber President and Teresanne O’Reilly, WLR. Paul Flynn pictured with Lynda Lawton, Waterford Chamber, Kathryn Kiely, Waterford Chamber President and Teresanne O’Reilly, WLR. Mayor of Waterford Cllr Declan Doocey with Colin Wallace, Sanofi, Kathryn Kiely, Waterford Chamber President and Teresanne O’Reilly, WLR. Colin Byrne, TOTEM presenting the award to Kevin Jephson, Ardkeen Quality Food Store with Kathryn Kiely, Waterford Chamber President and Teresanne O’Reilly, WLR. Dr Patrick Lynch, RIKON/WIT presenting the award to Michael Larkin and Ger Murphy, Murphy Larkin Timber Products with Kathryn Kiely, Waterford Chamber President and Teresanne O’Reilly, WLR. Alan Ryan, AIB Bank presenting the award to Conor O’Byrne, RelateCare with Kathryn Kiely, Waterford Chamber President and Teresanne O’Reilly, WLR. Paul Nolan, Dawn Meats presenting the award to Colin Wallace, Sanofi, with Kathryn Kiely, Waterford Chamber President and Teresanne O’Reilly, WLR. David Cooney and Tracy Quinlan, Morgan McKinley presenting the award to Mike Leahy, Spraoi with Kathryn Kiely, Waterford Chamber President and Teresanne O’Reilly, WLR. Sara Mullally, Waterford Chamber Skillnet presenting the award to Sylvia Gaudino, Dawn Meats with Kathryn Kiely, Waterford Chamber President and Teresanne O’Reilly, WLR. Celebration time for the staff of VirtualVet, winners of the Waterford final of the National Enterprise Awards 2019, included were Sinead Quealy, Managing Director, VirtualVet, and staff members, Narjis Hasan, Caitriona Lynch-Walsh, Colin Byrne and Ger Keenan. â&#x20AC;&#x2DC;An idea hatched in my kitchen is now a thriving business.â&#x20AC;&#x2122; Pip & Pear, a chilled baby food business founded by Irene Queally, started as a simple idea and has grown into an established, flourishing business, thanks to the support of Local Enterprise Office in Waterford. LEO provided her with mentoring and financial supports that allowed her create new jobs and develop new products. If you have a business idea, talk to any one of the 31 Local Enterprise Offices around the country. Together, we can make it happen. Jacqui Gaule (Local Enterprise Office Waterford) and Irene Queally (Pip & Pear). the town so early in the season. “It is also a great opportunity for us to showcase the venue, not only for racing. We also have a music festival later in the year and we’re working hard to establish it as a destination venue for Tramore and Waterford.” Always keen to collaborate with the business community, the Racecourse have just announced the catering and hospitality contacts have been awarded to two of Waterford’s most successful businesses – the Vee Bistro and the Kazbar. “While we have been delighted with the level of hospitality in the past, we are always looking to improve our customer experience and it is wonderful to bring two local businesses who are renowned for their service and quality to the team. We look forward to many great days at Waterford and Tramore Racecourse with them long into the future,” concluded Owen.  First race times: Sunday, 14th at 14.15 and Monday, 15th at 16.55. Visit www.tramore-racecourse.com for further details. for the future. There is great diversity in the mentors, who come from right across the business spectrum. It’s a fantastic programme. Our Future of Finance events showcase how organisations have embraced change and how they are embedding new technology and processes within their finance functions. It’s not always about the complicated big ticket items, these events give confidence to the local business community that change is within their reach. DAN MULHALL and LOUISE RICHARDSON Mayor of Waterford Cllr. Declan Doocey with Dan Mulhall, Irish Ambassador to the US, and Professor Louise Richardson, ViceChancellor of the University of Oxford. WATERFORD TRUCK & MOTOR SHOW RETURNS With a record year for Waterford Truck & Motor Show in 2018, the show has cemented itself as the premier Truck & Motor Show of its kind in Ireland. This twoday event has been attracting exhibitors and attendees from Ireland and the UK, who have commented that the Show is completely unrivalled in Ireland. The 2019 Waterford Truck and Motor Show will open to the public at Tramore Racecourse from 11.00am on Saturday, 4th May and from 10.00am to 4.30pm on Sunday, 5th May. It will not only be a great show, but it will be a weekend of country music for everyone to enjoy. Tickets available at www.waterfordtruckshow. com and at the gate on the day. As a nonprofit organisation, this year the Waterford Truck and Motor Show will be a fundraiser for the RNLI (Royal National Lifeboat Institution). and more recently within the credit union sector, Laura brings a bank of knowledge and creativity which she hopes to implement across the Matrix branches. Speaking on her appointment she said, “This is a very exciting time in my career right now and I am delighted to take on the role of Senior Marketing Executive with Matrix Recruitment Group in Waterford. I am really looking forward to the many exciting projects and campaigns we have planned for this year already”. SPIKE ISLAND SPICED RUM Spike Island Spiced Rum, produced by Waterford Company Anchor Spirits Ireland Limited, was lauded with a Gold Medal at the recent Global Rum & Cachaca Masters held in London. The Global Rum & Cachaca Masters is organised by The Spirits Business in the UK. There were twenty-five finalists in the Spiced Rum category and Spike Island took one of just six Gold medals awarded. Strictly blind taste tested, the Rum Masters is considered one of the most sought after accolades on the rum awards’ calendar. MONKEY CUPS Monkey Cups is a simple, innovative solution to reduce Ireland’s daily 528,000 disposable cup environmental singleuse plastic waste crisis. National Enterprise Awards, Waterford Finalist 2019, Monkey Cups, the new Irish-designed barista standard coffee cups, began with a sketch by Mailo Power, fuelled by her passion to turn the tide on single-use plastic waste that is invading our environment by creating a innovative, reusable, simple alternative. They are bringing a homegrown environmental, sustainable and cost effective solution to the marketplace. Keep an eye out for them, you’ll be enjoying your coffee in a Monkey Cup soon! VISITS WATERFORD Australian Ambassador to Ireland, His Excellency Richard Andrews visited Waterford Chamber with his wife Saovanee, where he met with Chamber members and discussed business opportunities and identified some areas of potential co–operations, and how these could be enhanced by the current negotiation on an Australia-EU Free Trade Agreement. Places are limited and you can get more information and register at http://communities.techstars.com/ ireland/waterford-ireland/startup-weekend/14306 It isn’t just for those with their own concept – it’s for techies, developers, creatives, marketeers, business people – anyone who would like to be involved in the excitement of a start-up. Michael Cox is one of Ireland’s foremost trainers and is fast gaining an international reputation as a leading light in Emotional Intelligence and Management Development, having presented as far afield as Durban, South Africa, Washington DC, Turkey, Swaziland, Belgium and the UK. Q: What has the best parent, partner, spouse, brother, sister, teacher, trainer, manager, human being got in common? suffer least from mental health issues; they live happier, more fulfilled and content lives. Q: What is Emotional Intelligence? differently to us and accept that their approach is right by them and that’s perfectly fine with you. The recognition of the hilariousness of differing viewpoints to your own. The appreciation that we are all ‘wired’ in a certain and different way and that’s what makes life interesting. The understanding that some folk are similar; some folk are very different. The respect of different viewpoints and ways of life as you would expect others to respect your viewpoint and way of life. Q: How does Emotional Intelligence work? A: People with a high level of emotional intelligence have high intrapersonal intelligence (a knowledge and understanding of oneself) and interpersonal intelligence (a knowledge and understanding of other people). As a result, people with high levels of emotional intelligence have the ability to: (A) Recognise people who are ‘wired’ differently to them. (B) Admire the ‘wiring’. Appreciate the strengths in other people and not focus on or berate them for their short comings. (C) Curb their behaviour so that it suits the ‘wiring’ of other people (D) Connect with other people, motivate them and ultimately be liked by other people. As a result people with high levels of emotional intelligence are very hard not to like. Q: Do people with high Emotional Intelligence have high self-confidence? with “ People high levels of emotional intelligence are very hard not to like. suffer this. They are who they are. No pretence. No mask. No act. They believe they are good enough and they have the confidence to just be themselves and celebrate their strengths and, importantly, forgive themselves their short comings and thereby, expose both in equal measures. They accept some people will like them and some will not – that’s fine by them. To them life is not a popularity contest. They show themselves to the world as they truly are, warts and all. Ironically, they are liked because they are sincere and honest. Q: Can Emotional intelligence be learned? by my environment to play and practice but no matter how much I practice I could not be a professional musician because I do not possess sufficient musical intelligence to excel. Likewise, with sport, a limitation of my bodily kinaesthetic intelligence. As a result, a common error we make with our children is saying, ‘you can be anything you want in this life if you try hard enough’. Simply that is not true and sets our children up for failure. More accurately we should say, ‘you can be anything you want in this life as long it is firmly based on an intelligence that you possess’. Emotional intelligence (Intrapersonal and Interpersonal Intelligences, numbered 6. and 7. above) can be learned. It can be learned by making a conscious effort to follow the steps A. to D. listed above or dare I say, by attending one of my EQ workshops as delivered by Waterford Chamber Skillnet. Q: Has Emotional Intelligence anything to do with high levels of mental health issues in Ireland? “ Aerrorcommon we make is saying, ‘you can be anything you want in this life if you try hard enough’. family for variations in multiple intelligences. My son, who has high bodily kinaesthetic intelligence returned home from six weeks of fun and frolics on an inter-railing trip woke up after a big sleep and was keen to get outside for a run or swim; hop, skip or jump; anything. He telephoned his friend (also on the trip) who has a very high IQ (a medical student who was awarded Trinity Scholar) to see if he would join him. His friend answered in a whispering voice. My son asked him where he was. He said ‘I’m in the library, studying’. It was July. Why does my bodily kinaesthetic son want to exercise and why does his friend want to study after six weeks abstinence – because if makes them feel good about themselves. Ireland, believe it or not, has the highest number of graduates per capita in the world. We are very keen to send our citizens to third-level colleges. It is my belief, however, that our secondlevel education system, with its rote learning, demanding study programme and preoccupation with points in the leaving certificate is at the cost of exploring and capitalising on other intelligences. There is no doubt that this may well lead to upset, sadness and depression; in essence, this may result in high levels of mental health issues and suicides. To be happy we must know where our strengths lie and utilise them at every opportunity; ideally make a living from them. Jonathan Hayes, Graham Drennan, Vincent Hogan and Cian O’Regan (Jaguar Land Rover) with Kathryn Kiely (Waterford Chamber President) and Teresa Jane O’Mahoney (BMCI Insurance & Investments Ltd). opportunities.” Speaking on behalf of hosts Auto Boland Jaguar Land Rover, Manager Vincent Hogan said: “As the newest garage on the Cork Road, we are thrilled with the opportunity to showcase the showroom and work with Waterford Chamber on such a popular event.” The Business Expo is open to both Chamber members and non-members to attend and exhibition stands are just €125+VAT for members, which includes the provision of a pod table. For more information, see www. waterfordchamber.ie or call Lynda Lawton on 051 311130.  Book an exhibition stand online at www.waterfordchamber.ie or call Lynda Lawton on 051 311130. Tramore is such a special place with so many secrets to uncover. Since the amalgamation of Waterford Chamber with Tramore Chamber of Tourism & Commerce and our subsequent chance to spend much more time in the seaside town, we have discovered there is so much to Tramore and here are just a few hidden gems. DID YOU KNOW? Tramore is home to four historic post boxes, three dating back to Queen Victoria’s reign (1837-1901) and one from her son King Edward VII’s reign (1901-1910). Those with Queen Victoria’s cipher are located at Cove Road, Church Road and Convent Hill, while Kind Edward VII’s is located at Railway Square. Interestingly, on 2nd May 1904 King Edward VII visited Waterford, arriving at Waterford North Station. The station Railway Square was decorated in crimson and a salute was fired by the HMS Aeolus, which was stationed in the river along three other ships. The King was entertained by the Mayor James A. Power, ‘The Bully Man’ at a reception in City Hall. The Royal party then visited the Waterford Show and proceeded to the Waterford South Station in Bilberry to take the train to Lismore. Before departing the King knighted the Mayor on the platform. The historic Doneraile Walk is a scenic route along the cliff overlooking Tramore Bay with views stretching from Tramore Promenade to the Metal Man and beyond. These views take in the Amusement Park, Tramore beach, the Backstrand, the Sand Dunes and then on to the other side of the bay, with views stretching beyond the Saleens and Brownstown Head. There are many features of interest along the Doneraile, which include a memorial commemorating the 360 lives which were tragically lost when the British ship the “Sea Horse” which sank in January 1816, one of the worst shipwrecks that Tramore Bay has ever witnessed. An ancient cannon gun also sits on route overlooking the Bay from a height. Another point of interest is the old Coastguard Station, now a Cultural Centre with a café and exhibition area. It is a fantastic place to have a coffee break, where you can check out one of the many local art and craft exhibitions or sit and enjoy the views of the Bay within the beautiful garden. With entry from Church Road, the Doneraile was first laid out in the 18th century by Lord Doneraile (a local landlord) as a private promenade, which he later donated to the townspeople. It once had steps (no longer accessible) leading down to Foyles Beach and Cove. Below, it has an open grass area with seating. The cove end of the walk has a series of steps down to “The Haunted Well” and onto Cove Lane, which leads to the Pier and up onto Cliff Road towards the Guillamene and Newtown Cove. he number of visitors to the Waterford Greenway in the first two years have been phenomenal. Growing these visitor numbers may seem like a logical goal for Waterford City & County Council, however, the main aim is to change the combination of visitors that make up the over 280,000 annual visitors. In 2017, 64% of visitors to the Waterford Greenway were from Waterford, 18% were from outside Waterford but still within the South East region, 16% were from outside the South East region and just 2% were international visitors. Visitors who travel further will spend more time and money in the area, resulting in a greater economic benefit for the whole of Waterford. Greenway users who stop for lunch, enjoy an ice-cream or pay for accommodation, all contribute to supporting local businesses and employment. Working to change the composition of visitors so that the percentage of internationals and those visiting from outside the South East increases is a much more valuable and realistic goal than increasing the overall visitor numbers. With this in mind Waterford City & County Council are working with local stakeholders and the Ireland’s Ancient East team in Fáilte Ireland to improve the visitor experience on the Waterford Greenway and its promotion. the Girona Greenway. With almost 100 enthusiastic local stakeholders at the workshop on 14th February in Waterford City there was a definite sense that collaboration is what the people, businesses and ambassadors of the Waterford Greenway in attendance wanted too. The success of the Waterford Greenway to date has been achieved through the hard work, collaboration and co-operation of many and it is these very things that will ensure the success of the Waterford Greenway into the future. With the Girona Greenway example in mind we should now strive to increase national, but particularly international visitors so that the economy of Waterford and the wider South East region can benefit. Our aspiration is for the Waterford Greenway to be the best known, the most travelled, the best remembered Greenway in Ireland. We want the Waterford Greenway to offer its visitors a safe, sustainable, quality, world-class experience. Collectively as businesses, communities and agencies we share, champion, protect and constantly strive to improve the Greenway, ensuring it is an iconic Waterford experience and leading destination in Ireland’s Ancient East. Bridget and Fionnuala Behal, Waterford English Language Centre welcomed Mr. Charley Kim from Jeonbuk Province of the Republic of Korea and Mr. Jay Kim owner of Pyung Hwa agency to cooperate on projects of cultural exchange, pictured here on a visit to Waterford Chamber, with CEO Gerald Hurley. Jeremy Coyle, Anchor Spirits Ireland presenting a bottle of Muldoon Irish Whiskey to Australian Ambassador to Ireland, His Excellency Richard Andrews. Matt Carthy MEP; Seรกn Kelly MEP; Gerald Hurley, Waterford Chamber; Deirdre Clune MEP. Waterford Chamber Skillnet is co-funded Carlow Kilkenny Skillnet, County Tipperary Skillnet, Waterford Chamber by Skillnet Ireland and member companies. Skillnet and Wexford Chamber Skillnets are co-funded by Skillnet Skillnet Ireland is funded from the National Ireland and member companies. Skillnet Ireland is funded from the Training Fund through the Department of National Training Fund through the Department of Education and Skills. Education and Skills.